Launching unlimited message templates in Collection. With the launch of Collections back in June 2018, it has become easier to organize contracts in multiple virtual vaults. The feedback so far has been phenomenal! In fact, many of you have now extended Oneflow to additional departments (sales, HR, procurement, and legal teams) within your organization with dedicated collections. That makes us very happy! You've asked for it, you've got it. Among the feature requests we have received, the most requests were around the possibility to create message templates for each collection. We have, and have always, listened to our customer feedback and with the August 2018 release, we’re excited to announce that we are making this new feature available to all customers. 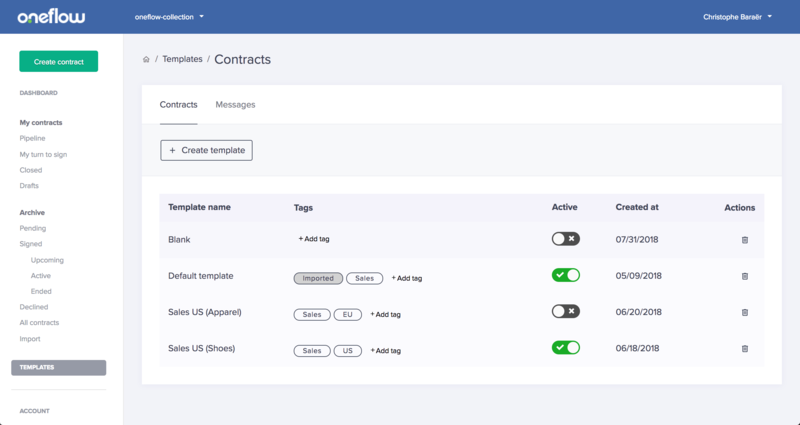 With Collection’s message templates, users with permissions can now create unlimited message templates within each collection to address. 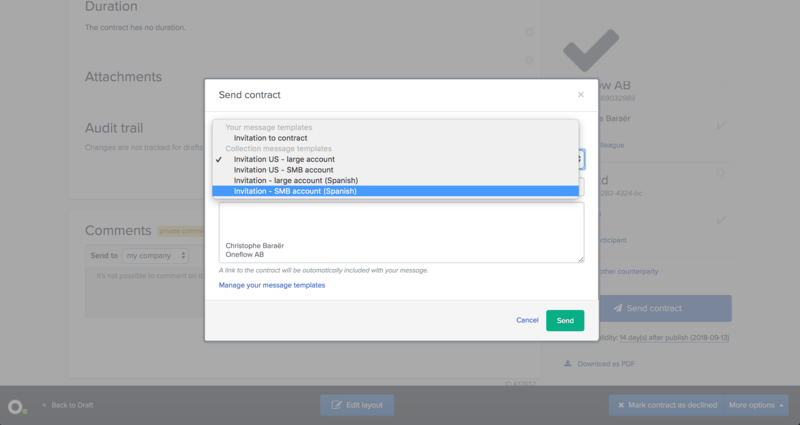 Message templates can be created and managed for all available message types – contract invitation, contract reminder, and same device signing – within the collection. Save time with each template you create. With the new release, you can create a set of message templates that are targeted at your prospects in your Sales Collection, and another set of message templates targeted at potential candidates in your HR Collection. Moreover, you can create a template specifically targeted at a particular segment of the market within your, in this example, Sales Collection. You can also make a template for each language as you wish. The truth is, you can have as many message templates as you wish in your Collection! To learn more about how to create and manage message templates in your Collection, please visit our Help Center here. Additionally, we have improved how private message templates interact with the message templates in Collections. As displayed in the picture below, private message templates now come in addition to the Collection’s message templates allowing for even greater flexibility. To learn more about how private message templates work, please visit our Help Center here. Ensuring that Oneflow remains easy to use as we expand with new features is our absolute top priority. As you may have already noticed, we began rolling out our updated user interface earlier this summer and have now redesigned the whole “Templates” section. The team is not stopping there and you can expect more great new features in the weeks to come. Stay tuned! For the curious ones, more information about the product management and design process will be shared very soon. Want to be notified when this is available? Subscribe to our blog here. You may have noticed some other minor improvements throughout the application, including a new breadcrumb, better empty states, and bug fixing. 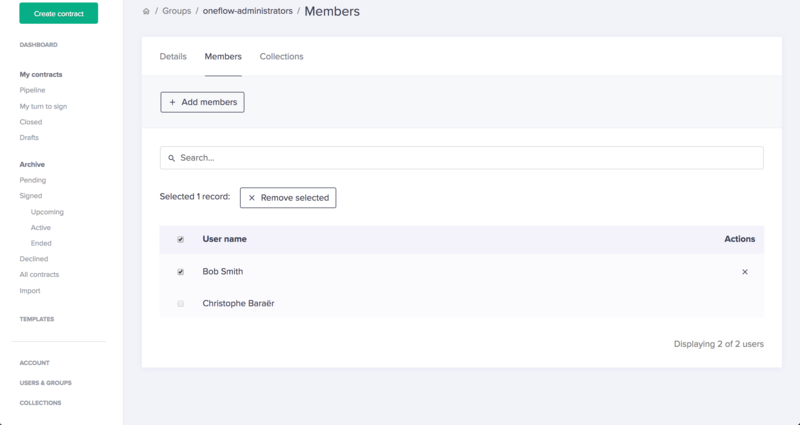 We have also prepared for batch actions throughout the admin section and are making it easier to remove multiple users from a group. Go to our Help Center for more details about message templates. As always, you’re welcome to contact our dedicated Support team at support@oneflow.com if you need help to get started with using the new message templates. Do you have comments, questions or feedback? Please feel free to contact the Product team directly at product@oneflow.com.